A variety of intense colors! Specially formulated low odor ink. 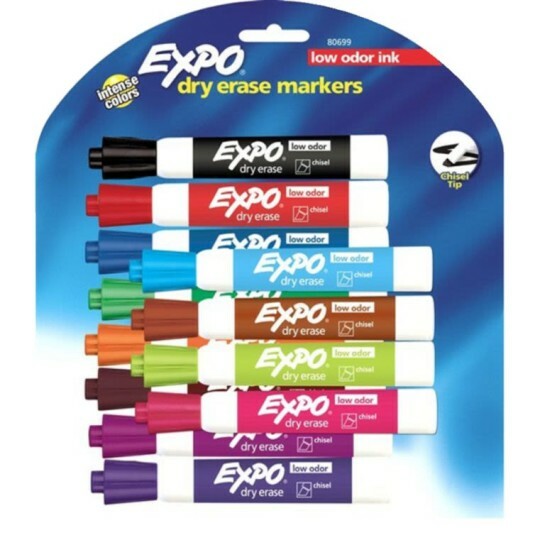 Quick drying and great erasability. Use on most whiteboards, glass, unpainted ceramics and non-porous surfaces. Non-toxic. we use it for games on the dry erase board in our classroom for our camp and after school program announcements to our parents writing alphabets numbers during homework etc. Smelt very strong. Irritated my allerigies and gave me a headache. Something has to be done about the odor. I would buy this product again. Works great and last long. Great for teachers! Easier to erase than chalk.